Synonyms: Syzygium huillense (Hiern) Engl. Dwarf suffrutex, growing from a rhizome, up to 0.6 m tall but usually less. Leaves variable, ovate, obovate to lanceolate-elliptic. Flowers often on new growth growing straight from the rhizome. The fruits are edible. Burrows, J.E., Burrows, S.M., Lötter, M.C. & Schmidt, E. (2018). Trees and Shrubs Mozambique Publishing Print Matters (Pty), Cape Town. Page 699. As Syzygium huillense (Includes a picture). White, F. (1978). Myrtaceae Flora Zambesiaca 4 Pages 198 - 203. Bingham, M.G., Willemen, A., Wursten, B.T., Ballings, P. and Hyde, M.A. (2019). 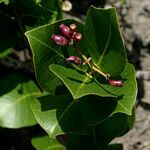 Flora of Zambia: Species information: Syzygium guineense subsp. huillense.